We have been learning to add detail to our writing to paint a picture in the readers' head. We have read, watched and learnt a lot about life during the war. We wrote letters home to the people we love to tell them about our life in the trenches. We had to imagine we were in the trenches and write like it was us in the trenches. Life in the trenches is muddy and soggy. There are billions of rats that are the size of cats! At night rats come and try to creep in the trench to take our food. I feel homesick most of the time. I really want to go home. I hear loud artillery booming at night and my comrades weeping and begging for help. In the middle of no mans land there is a barb wire fence that the postmans horse jumps over. What is it like on the other side of the world? As I sleep I struggle because there are people squishing between me like an animal. I have to sleep standing up. Smoke is one of the things I always smell. Sometimes I only get a biscuit to nibble on for the whole week. I feel awful. Mud fills up my boots as I walk along the fawn brown mud. If you wanted to live in a trench I am telling you its dangerous. I really hope i don't get trench foot. If I get trench foot they will cut it off. When it is bed time I feel lonely because I want to be with my family. I miss you Mum. I really hope I see you soon. Christina's goal is to begin her sentences in different ways.How well do you think she achieved her goal? Its rotten in the trenches and the rats are as big as cats. How would you like to be in the trench? Yes or no? It is so sad because my friend is getting her foot cut off. Ouch to get their foot cut off it hurts badly. I don't want to be killed. People are shooting guns at us all the time. You can hear the guns shoot loud as. The people are dying every day and night too. I eat bicuits as hard as rock. I feel dead inside. I miss you. Katie's goal is to join 2 sentences together in different ways. How well do you think she achieved her goal? I am tired of my friends getting killed or injured. There are body lice that bite me all the time. I try not to scratch them. Artillery makes the land deadly, rats gobble up food of mine and my mates. It's tough fighting because artillery is surrounding us. Dead bodies start to stink. It's a pain climbing out of the trench to the Western Front the Turks are my great enemies. I really want to go home but know I can not I have to stay in the war to attack for New Zealand. I have earned my sixth badge. To me war feel like a new life of terror and survival plus so much sadness. What is it like back home happy, sad or sort of? Boom! Boom! Bombs have started exploding. Torty (the tortoise) is still in shape. I see people from the army with wounds, cuts and scars. I feel so sad the people have been getting shot like the old postman. And please tell Sergeant Rames family that I am sorry but he has been amputated above a blood knee. It was a fun time travelling to Europe but now it is tough. At night I just think about eating my Mums toasted sandwich. I once bit a soldier when I was asleep and thought I was eating my Mums toasted sandwich. I wished none of this happened but it has. Some really really poor men have gotten their whole body in scars and blood. Each day passses with dead lying, some sob because of their wounds. My friend that I met when I was six years old Richy has lost his first eye please tell is mother and father thank you. I have only got one little scar on my arm. Men have been amputated. Richy's friend Stand has been. I've made new friends in my trench. A sand bag from the trench has already squished a soldier. It's really sad. I'd not want to go to another war for revenge I hope I don't have to. I am tired of fighting. Greg is still alive, is Rory alive? Angus M's goal is to begin his sentences in different ways. How well did he achieve his goal? Trench life is sooo...evil that I have ever ever ever seen in my life. No mans land is the most deadly place I have ever seen. Body lice, ticks and fleas drink our sick brown blood. 50,000 flies are buzzing around us. Kapow! Kapow! cannons and guns are blasting so when I try to sleep cannons are roaring so I can't sleep. Jet fighters are throwing artillery on our trench. We have to use out home made bombs and we heave it into the trench the enemies trench. You think its fine but it's not. We have to eat evil food. I am so sad there is muddy water to drink! My friend has sliced his whole arm. I ffel like my heart is breaking. Ashwin's goal is using quality vocabulary. How well do you think he did with his writing? Life in the trenches is awful! Stinky dead bodies lay in the narrow trenches. The stretcher beareres marched to scoop up the dead bodies with the long beds. Boom! went the sounds of the strong gun as they filled the pitch black night sky. Red, orange and yellow sparks flew across no mans land back and forward. Every day we have to eat a little bit of food. I wish I could come home to you. Two of my fellow comrades still live, Gemma and Freeda a dog. When I think of home it makes me feel homesick. Charlotte's goal is to begin her sentences in different ways. How did she go with her goal? The trenches are rotten. 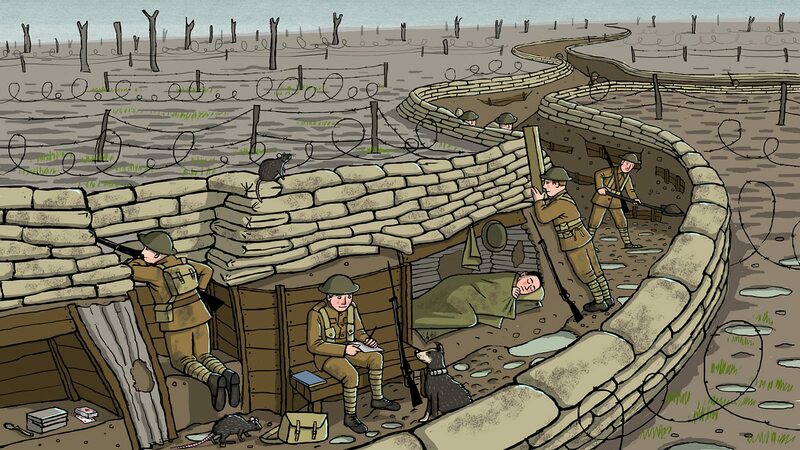 In the trenches it is muddy and rats are everywhere and when you sleep you have sore feet. When it is wet I scratch heaps because of flies and other stinky old bugs. In the night it is cold when me and the soldiers sleep. In the night when I hear artillery everywhere kaboom, bang, boom and I only get a half sleep and I want to come home. I can't stand it anymore. I am sick of people dying and my mates dying and I am sick of guns shooting too. I really want to come home but I can't I have to save New Zealand to keep New Zealand a safe place to be. I wish I was back home in my comfy PJs and in my bed. In the field of no mans land is a new bomb that is poisonous gas. Zephaniah's goal is to join 2 sentences together with different joining words. How do you think he achieved his goal? In the trench it is very muddy and dirty! The trench is narrow. My job in the war was to fight and hand dig a trench! When I went to war it was really dangerous. I had to eat meat in a can and dry biscuits. When it was Christmas all I got was an orange. When I went to fight I saw stinky dead bodies lying on the ground. I was smart and made some bombs out of my cans. In the trench I had to eat, sleep and fight! The ground in the trench was slimy and damp and hot because I’ve been wearing these clothes for a long time now. Life in the trench is awful! I hate wars! Everyday all that I can hear is tank engines rolling up and killing lots of my friends. All I can see is guns shooting and dead people suffering on the ground from the bullets. I feel scared and I’m shivering from the loud noises and to make it worse they’re even louder at night time! At night cat sized rats were eating everyone’s food and they make really loud noises that wake my friends and me up. When the fighting around us was finished all I could see in No Man’s Land was dead people, bullets and fire. All the bullets were covered in blood. Today, I hope I’m going to come home. I’ve caught a very bad chill from night time and I’m scared because I don’t want to get trench foot! Lots of people have been dying in wars and especially in this one! The brick red blood oozes out of dead people. The bronze ground turns into scarlet ground. I really want to come home today! Love Louisa. Louisa’s goal is to begin her sentences in different ways. How well has she achieved her goal? Life in the trenches is stinky. Lots of people died because they got shot from the artillery on No Man’s Land. All the time I hear guns going bang. It was hard to go to sleep in the soggy watery dirt. All of the time I am hungry because I only get a biscuit and a little bit of cornbeef because it has to last just about all week. It is so hard to not eat the food because I am tired of looking at it. I can smell smoke from the canons and from the dead bodies of friends. Some have been wounded from the Turkish fellas. Lots of them were shot from the New Zealanders. I hope to see you again in a while. Love from Jack. Jack W’s goal is to use capital letters and full stops. He is also working on using vocabulary to create a picture for the reader. What words helped you get a vivid picture of life in the trenches? Trench life is very horrible! There are rats the size of cats and it is muddy. It is never ever a cool and fun place to live! It is a dangerous place with the Turks shooting at us! There are flies, ticks and body lice. Our food is dry and sometimes it’s hot, sometimes it’s cold. We have to stay here for two or three years. Rats are eating our food. The soldiers are moaning and I hear guns firing and canons shooting us! I am scared of going out of the trench. Soldiers are dying and turning rotten. My biscuits are hard and dry. It is a deadly place to live. I want to go home but I can’t! It is the rules – if you do you get shot and I must serve my country. We have to fight, eat and sleep in the trenches. Our food is gross. Homemade bombs keep going. The Turks are our great enemy to defeat. I must win the fighting! I love you so much. xox Love Jordan. PS. Be safe. I will save New Zealand. Jordan’s goal is to use vocabulary (the best word) to create a vivid image for the reader? What words helped you get a picture in your head of life in the trenches? Trench life is miserable. I am eating hard dry biscuits and it is deadly! Cat sized rats are eating the war scraps. I think will I live or not? I am in a terrible condition in a tight squeezy place. Tank tracks are roaring over head. My enemy are deadly because of how many tanks they have. I can see my mates sobbing because of their injuries. The tanks are my deadly enemy. Their jam tins are home made bombs. I don't want to have trench foot. My mates have trench foot. Even when we scratch it still itches. The trench is pitch black. Ps. I wish I could come home bit I can't. Ticks are shocking to me causing nerve ending itches. My mates are dying from these terrible conditions. James' goal it to use vocabulary (the best word) to create a vivid picture for the reader. How well did James achieve his goal? Excellent stories Room 16/17 ..... I really enjoyed your descriptive piece of writing.... I hope you are reaching your goals.... well done.